this weekend, the national tour of cinderella was in town. as usual, i barely saw ryan all weekend because he worked the load in, the entire run of the show, and the load out. since i love the story of cinderella and since i've played the role of cinderella twice, i wanted to see the show, so my parents joined me. before the show, we met up with ryan for dinner during his break between performances. 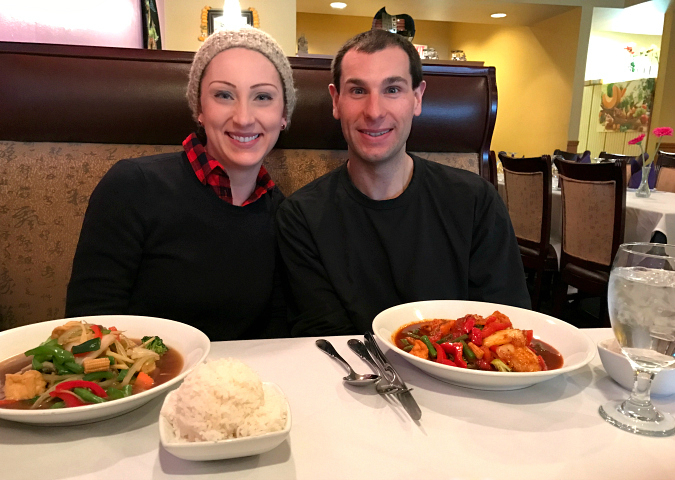 we grabbed dinner at one of our favorite thai restaurants before heading to the theatre. we had great seats and really enjoyed the show. the set was gorgeous and the on stage costume transformations were really incredible. The show was very good. A bit different version than Disney but still very good. I enjoyed the Thai food also.